We started out with a couple of strawberries that weren’t quite ready to be picked, but she definitely figured it. 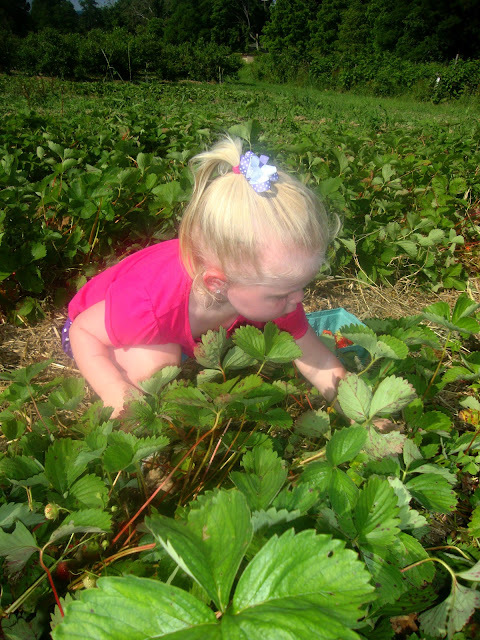 Look at her getting down real low to find the perfect strawberries. She even has her basket half way filled. 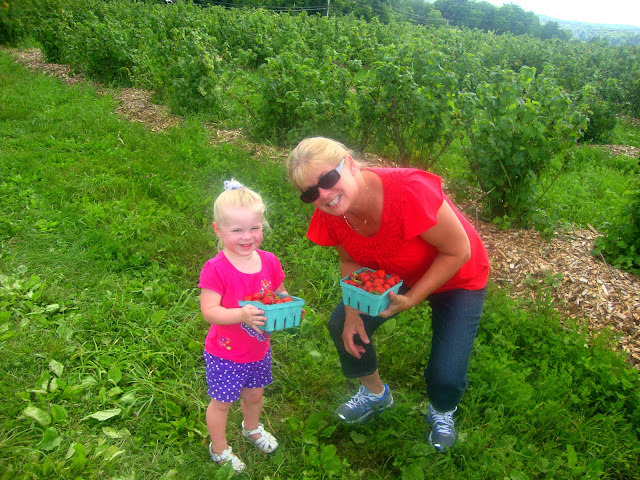 It was Grandma’s first time strawberry picking too. 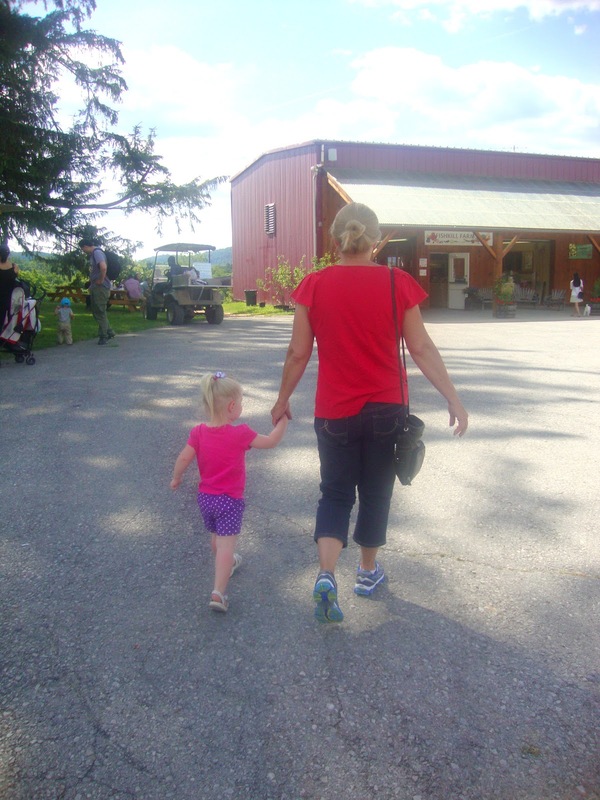 Riley is my mom’s first grandchild and my baby loves her dearly. Riley started going to my mom’s when she was two months old when I had to go back to work. This past winter Riley started going to another daycare twice a week and will go there full time next year. I know that my mom is sad that she won’t have Riley every day, but it will give her a chance to be just Grandma. Sometimes I feel like my mom has had to be a disciplinarian with Riley and that’s just not fair to either one of them. I love my mom from the bottom of my heart and I hope she realizes how much I appreciate all that she has done for my little family over the years. Thank you mom! Me and my girl. She is such a sweet girl. I loved this picture because it caught me playing with her hair, which I love doing because it’s so soft and fine. So I needed to use all of these strawberries. I made a Belgian chocolate cream cheese filled brownie with a strawberry topping. It was delicious! It came out more like cake than a brownie, which was fine by me. Just hand over the fork, honey. Make the brownie batter according to the package directions and spread half of it in the pan. Drop bits of the spread on top of the brownie batter. I say drop because it is difficult to spread. Finally add the second half of the mixture on top and bake. 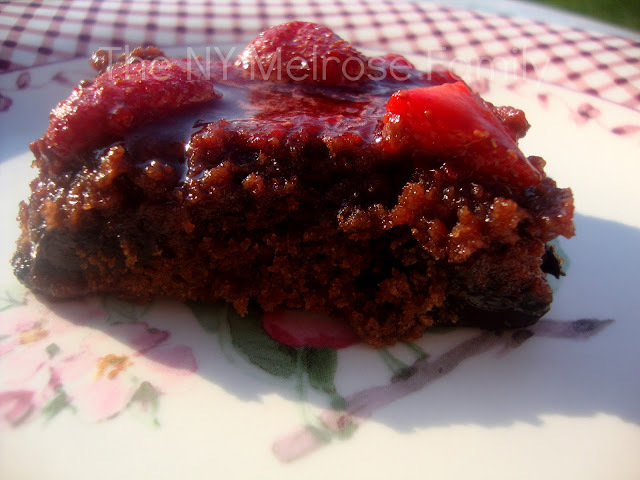 Over medium high heat mix the 2/3 of the strawberries with the sugar and vanilla extract. Cook for 5 minutes until the sauce starts to thicken. Add the final 1/3 of the strawberries and cook for three minutes. Chill the sauce in the sauce. The sauce worked perfectly over the brownies, but would also work on ice cream, cheesecake or angel food cake. We love to pick strawberries..That dessert looks so good, I am going to have to steal that recipe. O.M.Goodness! Those look delish! 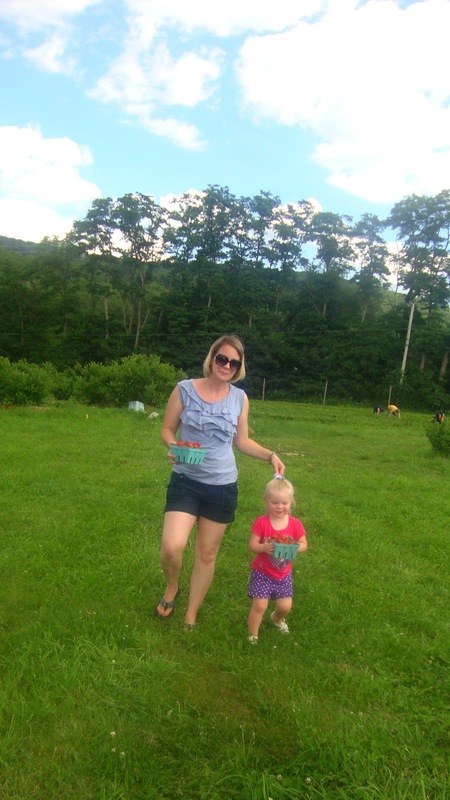 We missed strawberry picking this year. Everything in Texas bloomed and fruited very early. That looks like so much fun! Adorable photos!! You have to let me know where that farm is! Loved this sneak peek even more into your life. Riley is ADORABLE. She really took her strawberry picking seriously. Then, your mom…wow, you have great genes. She does not look like your average grandma. AND the pictures of you and Riley were precious. What a great memory for everyone. what a great flavor combination! I will definitely try this…thanks for the new twist on brownies! Okay those look amazing and your daughter is adorable! Your little angel is so adorable! 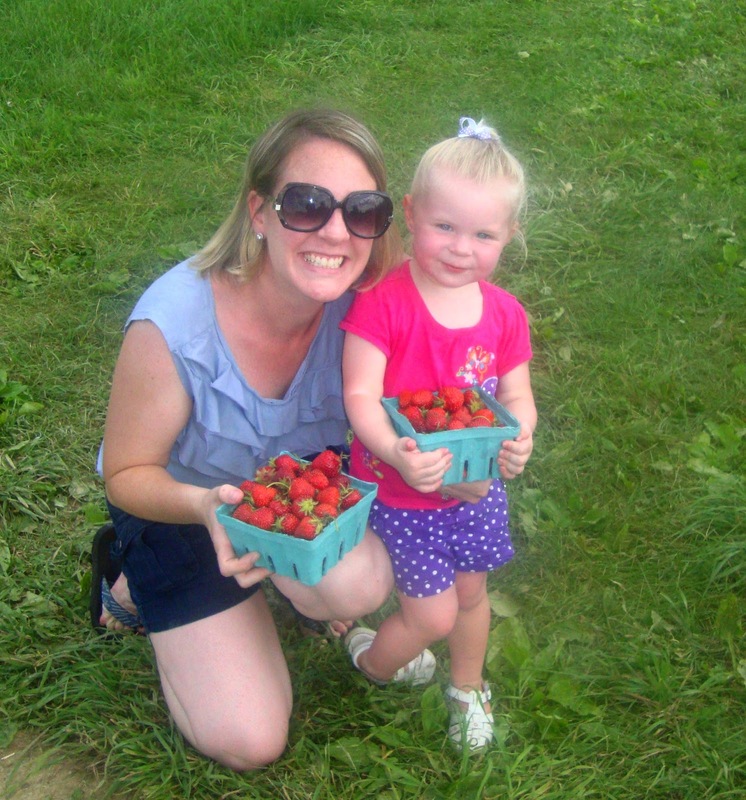 Looks like she really enjoyed strawberry picking, and oh my gosh, that brownies looks so yummy! She is so stinkin cute! And that recipe for your topping looks amazing! I love your dessert and wish I could taste it! This sinful brownie goodness is added to the dessert menu for Munch's birthday! Thanks for sharing!! oh yum, thanks for this recipe! So fun!! Riley is getting so tall and “little girl” looking! Wish we could all strawberry pick together! She's adorable!! Oh, how fun!! And those brownies look delicious!! Thanks for sharing at Sharing Saturday!! This looks awesome! 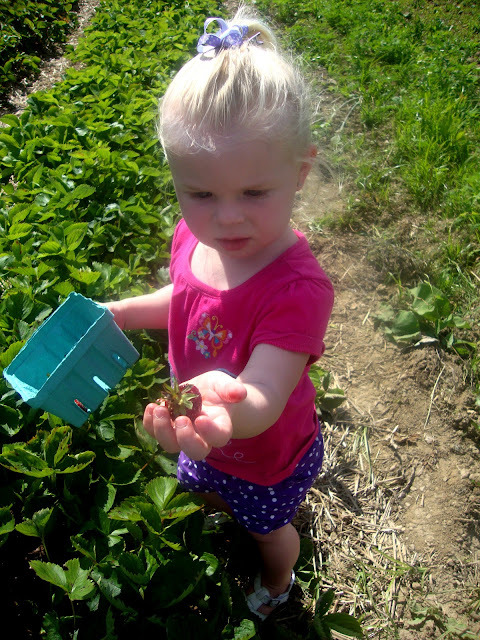 Your little girl is adorable and loved picking the strawberries I'm sure! 🙂 Thanks for sharing on Saturday Show & Tell at Cheerios and Lattes last weekend! We love having you join us and hope to see you again this weekend! See you soon! I just want to mention I am newbie to blogs and seriously loved this page. Almost certainly I’m likely to bookmark your website . You amazingly have superb articles and reviews. With thanks for sharing with us your web page. Your princess is so cute.